They feature 7 Catch closures with a hinged lid with lid stays. The case is from their ISP / EU Case Range. The weight of each case is 13.2 kg. The Part Number is EU070070-3010. They feature the checkerboard pattern and can be stacked. Hardigg Pelican Transport Case. Dimensions are 59cm x 59cm x 30cm deep (External diameter) 51cm x 51cm (Internal diameter) 17cm deep (bottom) 8cm deep (top) 5 catch closure latches Fully waterproof Stackable (check board pattern) Single handle Pressure release valve Comes with foam as seen in photo, which is easily removed if you’d prefer. Used condition, items may vary from picture. Discount available on collected items Please call Colin on 07881 092508 for more details. They feature 7 Catch closures with a hinged lid with lid stays. The case is from their ISP / EU Case Range. The weight of each case is 22 kg. The Part Number is EU0120060-3030. They feature the checker board pattern and can be stacked. Genuine Peli Hardigg, "indestructible" case! Great for Marine, Airsoft, Camping, Trailer & Vehicle tool chest, Drone transport and lots more! Direct from the British Army / MOD. The item dispatched will be the one shown in the first 7 photos. British - USA - Army - Military - MOD - Surplus. 1 x Pressure Relief Valve. Approximate Weight 33kg Empty. 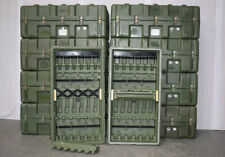 Security minded storage and transport for 12 rifles 24 magazines. Case in super issued use-able condition with age related wear and tear. Hardigg Single Lid Case - Pelican. Hardigg Protector Cases provide maximum strength and durability. British - Army - Military - MOD - Surplus. Approximate Weight 9kg Empty. 1 x Pressure Release Valve. Hardigg Single Lid Case - Pelican. Hardigg Protector Cases provide maximum strength and durability. British - Army - Military - MOD - Surplus. Approximate Weight 4kg Empty. 1 x Automatic Pressure Release Valve. The Peli iM2750 has four press-and-pull latches which are secure but easy to open, with help from the Vortex® valve, which equalises the internal air pressure automatically. Width (mm): 500. Depth (mm): 366. Pelican's patented Comfort Grip Handles. Weight 6.1kg (Empty). Used condition, but still fully functioning. Foam lined. See photos for details. Molded-in, tongue-in-groove gasketed parting lines for splash resistance and tight seals, even after impact. Very rare example in the UK, Large size HARDIGG flight box. With the foam / padding still in the box. Storm Case Hardigg iM2050 Case in Black - No Foam. This Storm Case Hardigg is watertight, crushproof, and rustproof with t wo Press & Pull Latches. Weight without foam Used but in excellent condition due to very little use. 7.57kg (16.68lbs). 3.8cm 7.0cm = 10.8cm (1.50" 2.75" = 4.25"). GENUINE GREEN HARDIGG CASE. What you see in the pictures is what you will collect, x1 green hardigg case. 59cm width x 58cm length x 49cm depth (inc lid). 54cm width x 50cm length x 46cm depth (inc lid). Hardigg Single Lid Hinged Case - Pelican. Hardigg Protector Cases provide maximum strength and durability. British - Army - Military - MOD - Surplus. Approximate Weight 9kg Empty. 2 x Side Carry Handles. Hardigg Large Single Lid Hinged Transport Flight Case. Hardigg Protector Cases provide maximum strength and durability. British Army - Military - MOD - Surplus. Approximate Weight 20kg Empty. 4 x Side Carry Handles. Hardigg Single Lid Rectangular Transport Flight Case. Hardigg Protector Cases provide maximum strength and durability. British Army - Military - MOD - Surplus. Approximate Weight 15kg Empty. 4 x Side Carry Handles. Genuine Peli Hardigg, "indestructible" case! Great for Marine, Airsoft, Camping, Trailer & Vehicle tool chest, Drone transport and lots more! Direct from the British Army / MOD. The item dispatched will be the one shown in the first 9 photos. Storm Case Hardigg iM2050 Case in Black - With Foam. Peli Storm iM2620 case no Foam Colour Black. iM2620 6.58 5.67. Protective Cases are specialist suppliers in the whole range of Peli Cases and Peli Torches. The Storm Case is an injection-molded case. PELICAN HARDIGG INDUSTRIES - Made in USA. Two drawers for your 8.5" 11" paper work. Two drawers that are padlockable for extra security. Two large drawers specifically designed for Pendaflex folders. Six drawer desk. Hardigg Single Lid Hinged Cube Transport Flight Case. Hardigg Protector Cases provide maximum strength and durability. British Army - Military - MOD - Surplus. Approximate Weight 15kg Empty. 4 x Side Carry Handles. Internal 41 / 41 / 34.